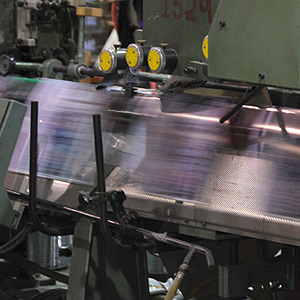 An automated, highly-scalable method of inserting one or more printed mail pieces into another, such as flyers into a newspaper or magazine. 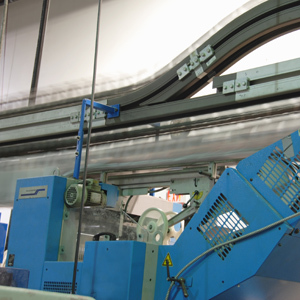 We have the production capacity for thousands or millions of pieces per run. Commonly used for small magazines, catalogues, newsletters and multi-page brochures, this process involves inserting printed pages one on top of another and stitching them together through the folded spine. Driving staples into a single corner of a set of pages. Binding several single pages together by driving staples into edges of the material, parallel to the bound edge. A type of coil binding where a double set of wire loops are inserted into holes along the binding edge of a set of pages. There are many color options to choose from. Wire-o binding is also a great way to combine different mixed paper stocks into one finished product. 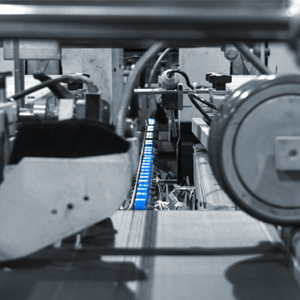 Also known as spiral wire binding, it's a process by which plastic wire is wound or threaded into punched holes to bind a set of pages together. 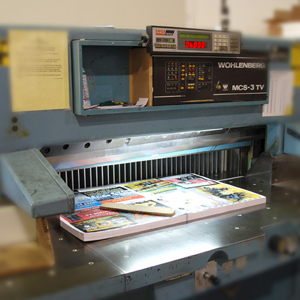 Cutting involves removal of extra material from the edges of a print job so that the size of the material matches the finished measurement of the job. Most projects require cutting in one form or another. Punching rounded corners into a material using a die. Common sizes include 1/8", 3/8" and 5/8" radius corners. 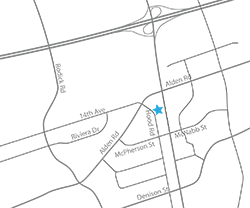 Round cornering helps to differentiate your printed piece from the standard square cut finish. A metal die that is fabricated and etched with a particular pattern. 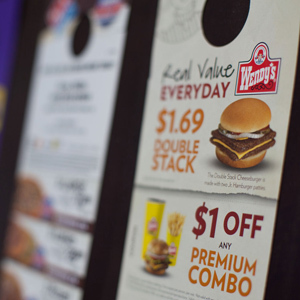 The die is mounted onto a machine that is then able to cut that pattern into a substrate, usually a flyer or other printed piece. Different metals can be used to create the die such as aluminum, brass and steel. The process of cutting all three unfinished edges at the same time, typically used for pasted books or magazines. Single or multiple holes can be drilled into a variety of paper stock. A special paper drilling machine is generally used for semi or fully automated drilling projects. 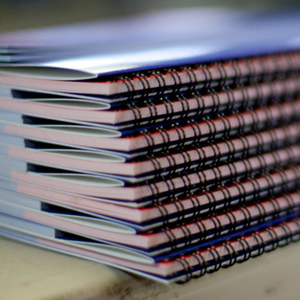 Usually drilling is part of a larger set of bindery services performed together, but it's available as a stand-alone service as well. 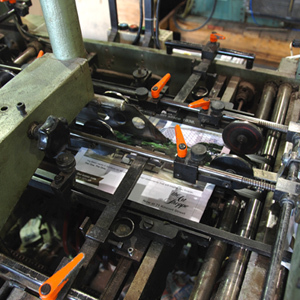 A process by which stacks of separate inserts are assembled in a particular order to form a set before being sent for further processing. When automated equipment cannot do the job and manual assembly of product is needed. Assembling different pieces of advertising (Magazines, product samples, etc.) together to form a completed "kit". © 2016 Tip Top Bindery Ltd.